I have finished the Imperial Knight, after about a year, and am pretty happy with the result. Rumours of a campaign boxed set for Sanctus Reach called Stormclaw are all over the place this week, and for me have resulted in a rollercoaster of conflicted emotions. Because obviously I wants it my preciousssssss! But do I? 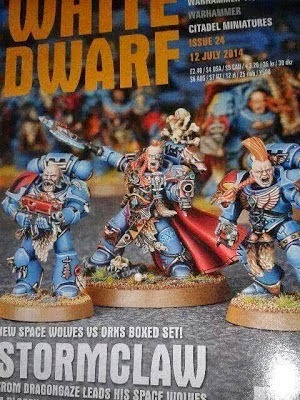 The boxed set is Space Wolves and Orks, both of which I play so initially I was all "bring it on!" *froth froth*. Then further rumours/leaks came out and the price ($190 AUD - don't get me started on exchange rates and AU pricing given the US price is $125 USD) and contents were revealed, along with screenshots of the 2 character models (pretty! so so pretty). However the rest of the box contents seem to be standard sprues of existing models. Now $190 is actually a pretty good price for what is in the box. A quick tour of the GW website to select the units individually had the price at around $270 for the same standard models, and that's not considering the 2 character minis, the mini rule book and the campaign book. So, as far as the word "value" can be applied to highly expensive little-painted-mens from GW then this box is good value. I don't need most of it, and I don't want to pay $190 for 2 limited edition character minis and some models that will sit in a cupboard in the painting queue of doom. I have already purchased the 7th ed rules at $140 and am yet to play a game. So the mini rule book and campaign book are nice, but can be lived without. I have all the ork minis - gretchin, nobs, kans and the load out of the new warboss is not wildly different to the AoBR warboss (ie powerklaw and some stuff). So my Kan Wall plans can continue. For the wolves, I have enough wolf guard termies, an unopened wolf pack box, and I rarely field a wolf lord and when I do it is on a thunderwolf, not on foot. That being said, with the 7th edition changes to the Rune Priest perhaps my HQ thinking needs a shakeup, but until I see the new codex I am not making any decisions. So. I will resist the immediate plastic crack impulse and instead put the $190 towards the new codex rumoured to be out in September, as well as a new shiny unit contained in that 'dex. Perhaps a flyer if there is one. Or even a pair of drop pods which I have been wanting for a while. Argh. Fiscal restraint. So unsatisfying. 30-something gamer balancing work and family with the very mature hobby of playing with little painted mens and going 'pew pew pew'. Have been playing 40k since 2008.